The BBC has released its full Christmas TV schedule - including a six-part adaptation of Les Miserables and the return of Idris Elba in Luther. Agatha Christie's The ABC Murders, a new interpretation of Richard Adams' Watership Down and Andrea Levy's The Long Song are also lined up. 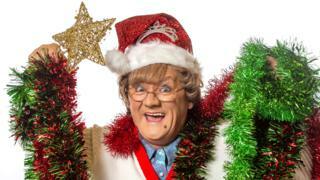 And old favourites such as Mrs Brown's Boys, Call the Midwife and Strictly Come Dancing return to our screens. Mary Berry and Nadiya Hussain will both present their own cookery shows. Charlotte Moore, director of BBC content, said: "We've got a wonderful array of stars to keep everyone entertained, with the very best in drama, entertainment, comedy and documentaries over the festive period. "There is something for everyone and I know our audiences will enjoy the fantastic range of magical treats on offer across the BBC." As has become tradition, another David Walliams' book has been adapted for the festive period - this time round, it's The Midnight Gang. Take That mark their 30th anniversary with a special one-off programme for BBC One and younger viewers may be keen to catch the animated version of Julia Donaldson and Axel Scheffler's Zog. The stars of Goodness Gracious Me will celebrate the show's 20th anniversary alongside celebrity fans of the hit BBC Two series. Documentaries focus on the likes of comedian Billy Connolly and The Snowman author and illustrator Raymond Briggs. Watership Down, about a warren of intrepid rabbits, features an original song from Sam Smith and will be split over two feature-length episodes. It boasts a stellar cast including James McAvoy, Nicholas Hoult, John Boyega, Gemma Arterton and Olivia Colman. Separately, award-winning screenwriter Andrew Davies - the subject of a documentary also shown over the Christmas period - has adapted Victor Hugo's novel Les Miserables for the small screen. Dominic West takes on the role of Jean Valjean in the French classic, with David Oyelowo as Javert and Lily Collins as Fantine. John Malkovich will return to BBC One playing Poirot in The ABC Murders, with Rupert Grint appearing alongside him as Inspector Crome. Ken Dodd will be remembered in How Tickled We Were on BBC Two, with the channel also seeing Chris Packham and Michaela Strachan exploring some of nature's celestial wonders and winter wildlife. Stars returning to Strictly include Anita Rani, Ann Widdecombe, Caroline Flack, Aston Merrygold, Jake Wood and Michael Vaughan. Arts offerings include Swan Lake from the Royal Opera House on BBC Four. And there will be four Top of the Pops specials on BBC One over the holiday period. Aled Jones will celebrate Christmas in Edinburgh with a thousand Songs of Praise viewers, while the Queen's Christmas Message and Carols from King's return once again.